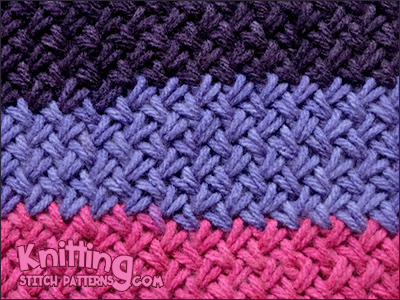 Row 1 - wrong side: Slip 1, * purl the second stitch on the needle and leave on needle, purl the first stitch, slide both stitches off the needle; rep from * to last stitch, slip 1. Row 2 - right side: * Skip 1 stitch and insert needle from back to front between lst and 2nd stitches and knit into the front 2nd stitch, leave on needle, then knit the skipped stitch, slide both stitches off the needle; rep from * to end. Repeat Rows 1 - 2.